Olentangy Liberty junior Kelly Levering (left) goes up for a rebound during practice earlier this month. The Patriots open the season against Mason in the Journey to the Tourney tonight at 7:40 p.m. at Lakota West in West Chester. Sam Krafty has seen plenty of highs and plenty of lows in his four years coaching the Olentangy Liberty girls basketball team. He’s seen four of his top players suffer season-ending injuries in the last three years. Alexa Fisher had a season-ending foot injury three years ago and Breanna Yashko tore her ACL and missed the end of the season two years ago. Last year was worse. Teegan Pifher suffered a season-ending knee injury just five minutes into the team’s third game. Then, Kennedy Kashmiry tore her ACL in the third quarter of the first-round district tournament game at Westerville Central. Krafty said the team is working in a strength-and-conditioning program to hopefully prevent future injuries. Liberty rallied to get to its second district title game in school history and first since it won in Krafty’s first season. This year’s team doesn’t have defined leadership roles yet. But Krafty is hoping that clears up before too long. Betsy Merritt, Abby Erickson, Jessie Barna and Kiera McCloskey are Liberty’s four seniors. All four saw playing time to varying degrees on last year’s squad. As for junior Kelly Levering … she made lemonade out of Pifher’s lemon of an injury. Levering was predominantly a spot-up shooter previously, but was forced to take on a different role after Pifher went out. Pifher’s return gives Liberty a formidable one-two punch with a knee brace as the only visual evidence of last year’s injury. Junior Gina Santangelo was another that stepped up last season. 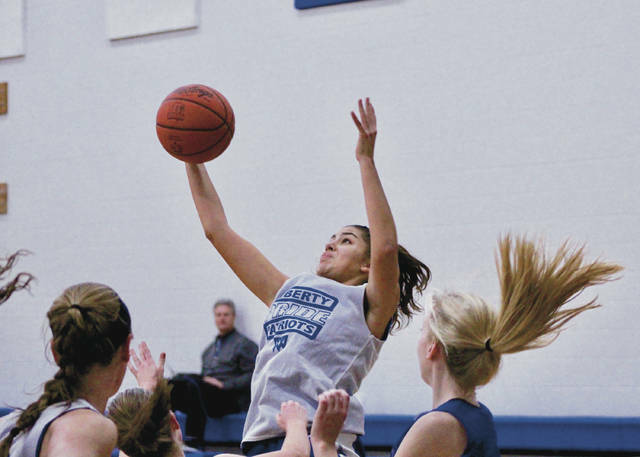 She’s the prototypical shooter that knocks down threes in bunches. Junior Tatum Perkins and sophomores Caitlin Splain and Sarah Balliett add depth for the Patriots. Balliett is a newcomer to the varsity roster. Liberty opens up at the Journey to the Tourney event against Mason tonight at 7:40 p.m. at Lakota West in West Chester.